Our family loves to go camping. It is a great way to get away and really enjoy nature and each other. And talk about some great family memories and adventures that are made on these trips! Just this past weekend, our family went on a camping trip to one of our state parks. It was a beautiful weekend. The weather was not too hot and not too cold. We went during Bass Pro Outdoor Days and camped with some friends that are in the same scout pack. To be honest, I think that our kids enjoyed it more than our family vacation we took this summer! 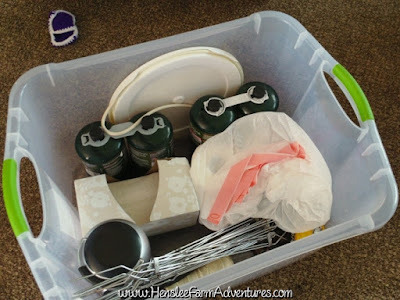 I thought it would be great to share with you some of the ways we prepare for the camping trip, and some of the things that we took or we wished we would have took. Note: With our kids we are not hiking-in our camping equipment. So at this time weight is not an issue with us. Likewise we are not interested in "glamping." We try to bring the necessities and at the same time pack light. Here are some of the things that we pack. We have totes that we use to keep some things at the ready. 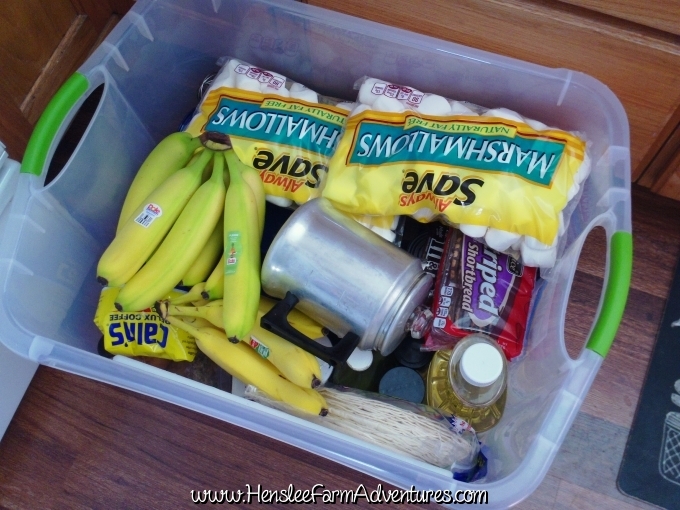 For this camping trip, we took two totes, one for food and kitchenware, and one for general camping supplies. We brought a cooler so we could bring foods that needed refrigeration. We wanted to make good meals for our camping trip and I think that we did that. The first night we had chili, then in the morning we had breakfast burritos, then the second night we had a polish sausage, potatoes, onions, and peppers dish. We probably could have cut down on the amount of items we took by sticking to hotdogs and pbj, but I love to cook out in the open. Of course we also had some bottled water that we brought. Our tent is supposed to sleep 4-6 people. I'm thinking that 4 would be the most comfortable. With any tent, make sure you are getting the size you need for comfort. And while a pop-up tent would be nice to set-up, its size would not be good for us. And honestly, once you get familiar with how your tent is set-up, it shouldn't be too hard. Note: Set up your tent before you go camping and make sure all the pieces are there, and don't forget the instructions! I would highly recommend an air mattress. We did not have one this camp out, we slept on some old quilts, and then our sleeping bags on top of that. It wasn't too bad, but after two nights, that was about all we could handle. We did have a foam mat that was supposed to be big enough for the kids, but I think only one kid ended up being able to sleep on it. We wanted to pack as light as possible, which really for this trip, we were running out of room in our car, so one duffel bag for four people was all I packed. We were gone for 3 days and 2 nights. In the future, I'm going to try and pack 2 duffel bags for us. 2 duffel bags, one for the kids and one for adults. 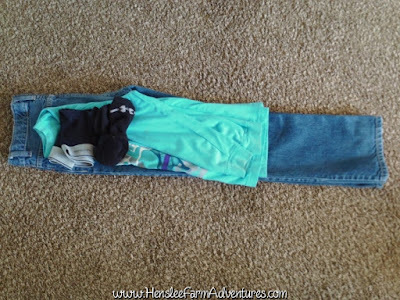 Or another idea would have each kid pack a backpack with their items in it. I thought I would show you how I packed the clothes. I put a complete outfit together with shirt, pants, socks, and underwear like below. And then I rolled it up and stuck it in the duffel bag. 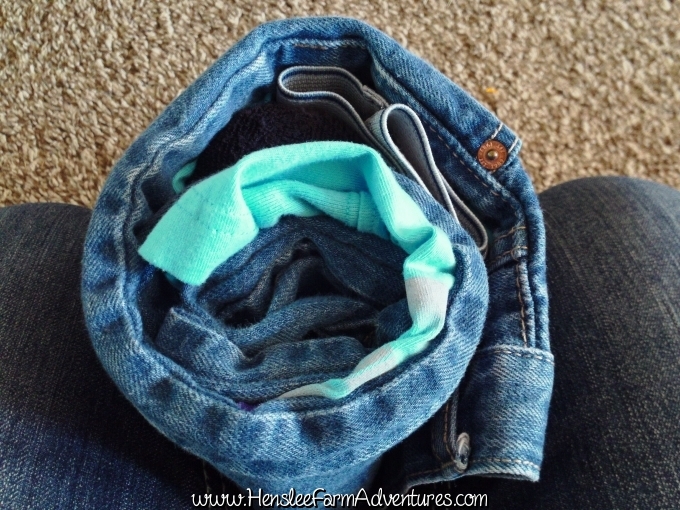 This way, we weren't searching for a pair of socks or underwear. Everything was together. Rolled up ready to be packed. Something we did take that we weren't able to pack in a tote, was our dutch oven. I did take a skillet as well, but our dutch oven would have been sufficient enough to cook in. As for our next camping trip, I know that we will be even more prepared. We are all eager for that next camping trip and we hope that it will be as much fun. 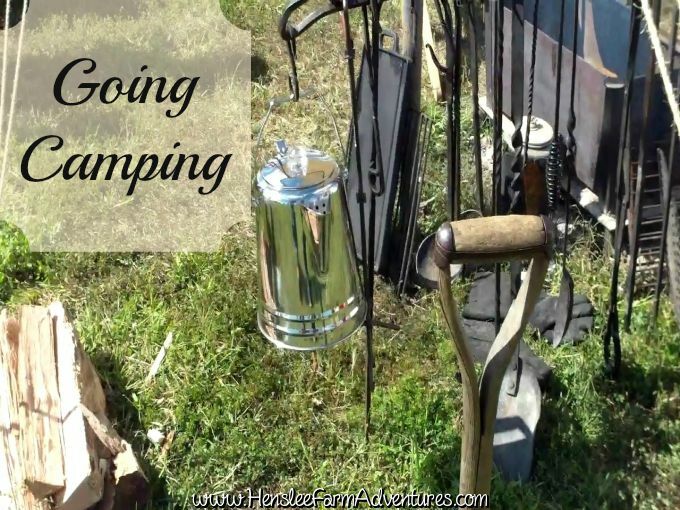 Let me know, what do you take on your camping trip?